Our goal is that music-making becomes a fun and cherished part of everyday life. Students of any age and ability are encouraged to experiment with different instruments, instructors, musical styles and other music-related subjects. Students are never required to perform in front of others, but may elect to share their learning during term-end student celebrations. Currently, private lessons are offered as listed below. If you don’t see your instrument of choice, give us a call—we add new instructors and instruments continually and make every effort to fill requests. All Shedd Institute instructors meet high performance, teaching, and ethical standards. Semi-Private Lessons. Bring a friend or family member and have fun in music lessons together! 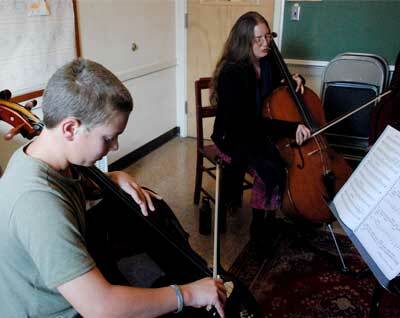 This is a great opportunity for siblings and parents to learn an instrument together. Semi-private lessons can be arranged for 2-4 students, are tailored to fit your needs, and are structured similar to private lessons: ½, ¾ and 1 hour. A sliding rate scale based upon the size of the group makes this an affordable alternative to private lessons..